Pest mice regularly cause issues for householders and businesses in Central Scotland, but they pose no problem to our mouse control experts in Fife, Perth and Kinross. 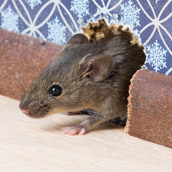 At Active Pest Solutions, we understand mouse behaviour. We also have the knowledge, skills and equipment to carry out effective mouse control in a wide range of situations including houses, factories, farms, shops, hotels, restaurants, halls, churches, sheds, garages, stables, etc. Our specialist mouse controllers will safely and effectively eradicate your mouse pest problems using health and safety approved trapping and baiting systems while keeping you, your business, your family, your pets and other wildlife safe. Mouse-proofing measures can also be implemented to help prevent mice entering your premises in the first place. As members of the Fife Trusted Trader Scheme and Perth and Kinross Better Business Partnership, our working practices, pest control qualifications, customer service and integrity have been checked and approved by Trading Standards officials, so you know we’ll deliver mice control you can trust. Other pest mice species in Scotland include the field mouse/wood mouse and the yellow-necked mouse. All three species often venture inside in autumn and winter as the weather deteriorates. If a single resident female mouse is happy in your premises and has plenty of food, 5–8 litters of mice a year can be born – each containing an average of 6–8 mice. The young mice become sexually mature at about eight weeks of age, and it doesn’t take a mathematician to work out that this could lead to a serious mouse control problem in your home or business premises within months. Mice are rodents, and it’s no accident that the word ‘rodent’ comes from the Latin word ‘rodere’, meaning ‘to gnaw’. Pest mice will gnaw on anything they can. As their teeth continually grow, they grind them down to a usable size by gnawing on anything and everything: from food to photographs, from textbooks to tents, and from plastics to pyjamas. In a domestic situations, mice can cause significant damage to water and central heating pipes or create a fire risk by chewing through electric cables. Skirting boards, furniture and appliances can be damaged and food packaging is shredded. Meanwhile, out in your garage, car electrics, upholstery and fluid pipes are all targets of these rapacious rodents. In commercial situations, machinery, stock and business reputations can also be damaged, so taking pro-active measures to prevent a mouse infestation can be cost-effective. APS offers a reliable, effective contract mouse control service throughout the Fife, Perth and Kinross area. If you have a mouse problem at your home, office or business premises, we can help: call us on 01577 862035 now or email to request a call back. We also carry out pest control in all surrounding villages and rural areas. Recently we were called to a house in Dunfermline where mouse control was needed after mice had gnawed through water pipes, causing serious damage to ceilings and ruining fittings and furniture, all of which then had to be replaced or repaired. Another requirement for domestic pest control in Dalgety Bay arose when mice dropping were found in pots and pans in a cupboard under a sink in a client’s home. Commercial pest control in Kirkcaldy was professionally undertaken by Active Pest Solutions in an electronics factory, with minimal fuss and no disruption to the work process. A regular service contract is now in place. On numerous occasions over the years, we have been brought in to carry out mouse control in Glenrothes, where commercial premises, gardens, garages, houses and sheds provide a comfortable breeding ground for disease-carrying rodents. If you need mouse control in Fife, Perth or Kinross, contact us now – before a small pest problem escalates into a major pest control crisis. Call Active Pest Solutions on 01577 862035 for help and advice, or request a call back. Chewing or teeth marks on insulation, food packets, etc. If you think you have a mouse problem at home, in your office or at your business premises, or if you want to make sure you won’t be troubled by mice in the future, contact us on 01577 862035 for prompt, professional pest control.